This topic contains 10 replies, has 5 voices, and was last updated by Laccaria 10 months, 4 weeks ago. Hello! I’d like to present my first puzzle to 1Across. Any feedback about clues or the puzzle as a whole would be gratefully received. As I type this, the Bank Holiday temperature is rising and wine o’clock is not far off…a glass of rose in the garden and a stab at the Guardian Saturday cryptic is in order (Arachne… one of my favourites). Thank you very much for sharing this, Wire. I liked your flexible use of the cross-referencing clues, and 1 Down conjures an arresting image! Overall I found your cluing clear and coherent. Unless I’ve misunderstood the parsing or there’s a variant spelling of which I’m unaware, is there a one-letter discrepancy between the wordplay and entry for 15D? In 12A ‘in order’ is rather the opposite of the usual type of signifier. This may well be more my issue than yours, but my preference would have been for a consistent font to mask your stages of revision. Thanks for pitching in on here; let’s hope others will follow suit! Hi Trigon, thanks for looking at my puzzle. I don’t know what on earth went on with the font…the software I use is very glitchy on this sort of thing and I didn’t notice it when I checked before posting. I’ve attached a re-formatted version 2.0 which should look more uniform. 15D…I’m not sure I’ve picked up the one-letter discrepancy : rev MANE O(URE)D …or have I missed something?? I started your SH! late last night and put it down scratching my head. I woke up first thing this morning and your device immediately jumped out at me…funny how that happens! I will give it my full attention today. Thanks for parsing 15D, Wire. My wrong turn was OW<R>ED. Hope that this pleasant Bank Holiday (assuming you’re in the UK) hasn’t become engulfed by SH! Nice puzzle, Wire. Shades of Araucaria with all the cross-referencing. I like the way you rang the changes in the meaning of the crucial 6d. 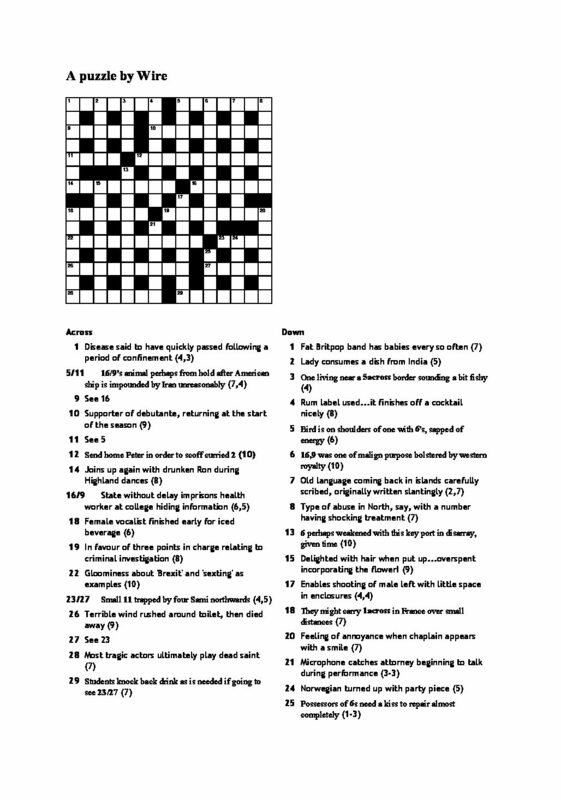 I got into the tangle of cross refs by guessing 11d as an animal (having the B), confirmed when I then cracked 23/27. In 12, as well as the unusual indicator, I wonder if there really is such a thing as curried 2? It works cryptically but it’s always better if the surface is credible. My knowledge of 2’s is limited, so maybe I’m wrong to question it? In 16/9, ‘Former’ at the beginning would make a more precise def. The word order is a bit stilted too: ‘without delay’ would come later in a natural sentence, wouldn’t it? The def in 19 is technically not correct, but fits with the way the word has come to be used very often. I’ve seen the anagram in 22 before (here), but I think your clue is probably better. Had me thinking the embedded ‘ex’s were the defining factor (as you probably intended!). In 28, many might object to ‘play dead’ as a way of indicating the anag. In 29, unless I’ve misunderstood, you’ve missed out a reversal indicator for ‘students’. Also the answer, as defined, is (3,4), surely? In 5d, there’s a part-of-speech clash in the wordplay. Should be something like “Bird is what’s on … etc”. In 20d, is that a recognised abbrev for ‘chaplain’? Thanks, Wire. Enjoyed cracking it, despite the niggles. Hi Whynot…thanks for taking on my puzzle and for your kind comments. I’m glad you enjoyed it. I wasn’t sure whether to put this forward, TBH. A few people who trialled it for me didn’t like the cross-referencing aspect…or at least felt that I had gone too far. I personally quite like puzzles like this that go a lot further! – 19 I found really hard to define according to the Chambers definition…I played with it for ages! So you have spotted exactly what I did instead…defined it as I thought most would understand it. Lazy clueing! – 5d I can’t see what’s wrong with what I have clued here…although PoS is something I am only starting to get to grips with consistently so I bow to your experience! I had thought that : BIRD = definition: IS ON THE SHOULDERS ON etc. indicates a noun also (omitting IT…which I believe is deemed acceptable?). – 20d it is in my Chambers…but I found it by accident and I’m not sure if I’ve seen it used before! Please do come back on any of the above, esp. re 5d. I am going to give In Beirut a crack next week…I am currently getting to grips with Trigone’s SH! which is occupying all available grey matter at this time! I liked all the cross-referencing and you certainly did ‘take it to the wire’. Not everyone’s cup of tea, I suppose. 28. [fodder] ‘playing’is accepted (the letters of the fodder are playing, by changing positions), but ‘play’ [fodder], which comes over as an instruction to the solver doesn’t really suggest moving the letters about. ‘Play with’ [fodder] is probably ok, but that doesn’t work with your surface. I think in 29 you should have written ‘knocked back’ (NUS has been knocked back). ‘Knock back students’ (again, as an instruction to the solver) could also give SUN — but again doesn’t fit the surface. I wrongly took the whole of “knock back drink” to code for ‘down’. SUNDOWN is one word when it refers to the event or its time, but to view the stars, you need the SUN to be DOWN (two words). SUN DOWN wouldn’t be a good entry imo, though, because it lacks ‘dictionary nature’. It really needed a different def. Maybe ‘Students knocked back drink at close of day’, or similar? Or maybe ‘…. after which, 23/27 visible?’ to preserve the cross-ref. Not at all sure I agree with you on 5d, but others might. ‘On shoulders [etc]’ is an adjectival (descriptive) phrase, but CAPE is the thing itself. I’ve read that verbal phrases can be acceptable to clue for nouns, e.g. ‘runs on road’ for ‘car’, but I would rather not use that myself. Hope you enjoy ‘In Beirut’. There are a few smiles to be had. Good luck with SH, too, which is a very clever puzzle and took me a few days to complete in bursts. Just a note from me – I’d seen a draft of this before it came up here. Useful stuff covered by others above; I liked 10a, 18a, 22a lots and 20d the most. I like this sort of cross referencing – makes it all a bit more interesting than a standard puzzle – but I wouldn’t want to see it all the time, of course. Hello Wire. You were good enough to review my recent post on here, so I feel like returning the compliment, albeit rather late in the day! But I’m a newcomer on here. A fine puzzle overall, although perhaps a bit on the ‘easier’ side considering what I’ve been told about 1Across (this site I mea – not the light in your puzzle!) I’ve already seen your contributions to Big Dave and Alberich. I tend to be less didactic about clue ‘grammar’, so I’d certainly pass clues like 28a even though the anagrind isn’t strictly correct. Favourites? As always, not easy to pick out. I was highly amused by the idea of “curried 2d” – I have my own recipe for 2d (it’s easy to make) and I tend to put just a dash of spices (including chilli!) in the mixture … whether the idea of ‘currying’ it strikes a chord, I don’t know. Perhaps someone ought to try it out! Anyway, not a reason to diss the clue as far as I’m concerned. I really liked the definition part of 4d – although the wordplay part wasn’t so exceptional. It took me a long time to figure out what on earth was the connection with “cocktails” – perhaps me being a teetotaller didn’t help much – but then it finally ‘clicked’. A good “aha!” moment. Excellent! And 22a – a splendid 1-word-to-1-word anagram! Not many of that length around (yes, everyone knows ORCHESTRA<->CARTHORSE)! And 21d – nice surface and wordplay if not particularly difficult. But I have to come up with the odd gripe – nothing serious! First of all, nothing to do with the puzzle itself, but the presentation. 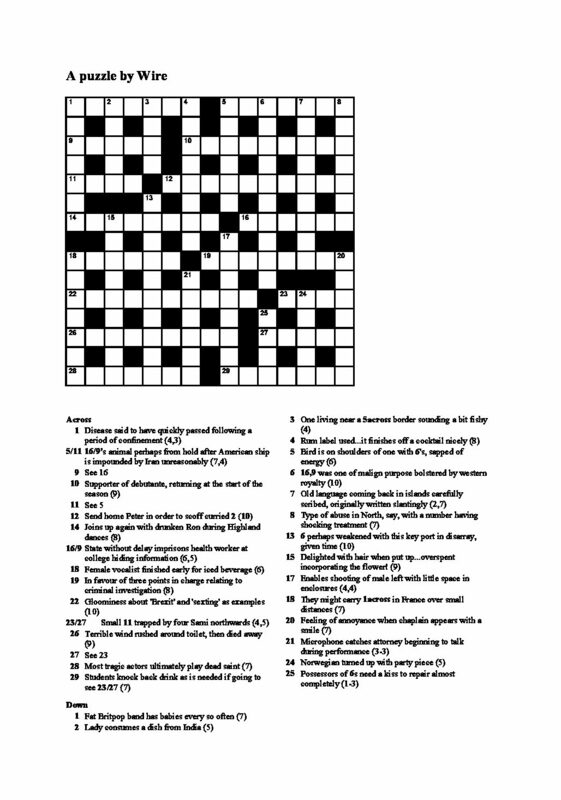 In the PDF copy which I downloaded, the clues are a mixture of Arial and Times New Roman, with different font sizes – and the grid is a bit on the small side. It would be worth your while spending some time tidying up these points on any future puzzles – it does matter to some solvers! For 14a I think the enumeration ought to be (2-6), not (8). There is always this problem when you have two “E” sounds together in a compound word. For 23a/27a, a nice hidden word clue but a bit spoilt by having to use the word “Sami” which is obviously rather obscure and hence gives the game away. In 26a I don’t like the word ‘rushed’ very much, it tends to spoil the surface. “Ripped” or “tore” would work better, I think. Is the word “terrible” superfluous I wonder? 24d – once again I think “Norwegian turned up” is a bit obvious – despite the excellent surface! Not even sure if the abbreviation is kosher. Similar comment about the abbreviation for “Chaplain” in 20d. This reply was modified 10 months, 4 weeks ago by Laccaria. Hi Laccaria, thanks for your review…I think all of your points are fair and I will take them on board. Yes, the fonts were all out on the first upload…you will see that Trigon alerted me so I re-posted a corrected version. That problem has never occurred before or since so I still don’t know what on Earth happened. Ah yes – I didn’t notice that Trigon had already brought up the formatting matters – sorry.